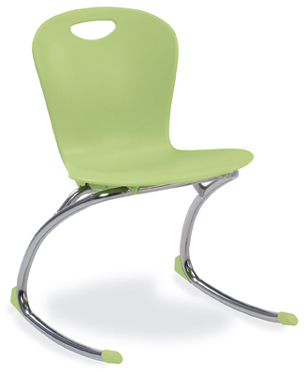 These popular rocking chairs with a moderate range of motion are appropriate for libraries, reading nooks, break rooms or as side chairs in the classroom. Guaranteed to brighten the mood of any environment. Available with 29 seat colors and matching glides. Open color palette. ZUMA rockers can be ordered with optional "bump" glides, which are designed for environments where limited motion may be desired, such as areas for children with severe sensory integration problems or autism.